Please refer to our stock # 95 when inquiring. 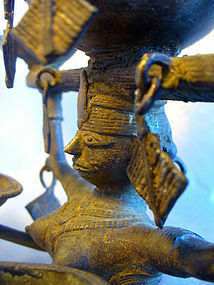 A second upper section from an Indian Tribal Oil lamp from the same region as item 92 in the form of a 4 armed Goddess. All four arms supporting a lamp with a central lamp above the head, the figure would probably have originally been mounted on an elephant or another animal. The piece measures 7 inches in width and 5 inches in height.